Cockatoo Bird Cages - How To Choose The Best? Cockatoos are great pets. They tend to be friendly and affectionate, and they are very intelligent. Their large size, though, can make buying them a home fairly difficult. Cockatoo bird cages need to be sized according to the breed of cockatoo. Rose breasted cockatoos are smaller and as such require less space than a moluccan. A good rule to go by is that a bird’s cage should be wider than their wingspan. This will give them plenty of room for the occasional wing flap. Most breeders with cockatoo birds for sale can sell you the right cage or point you in the right direction. Cockatoos need to spend lots of time outside of the cage. 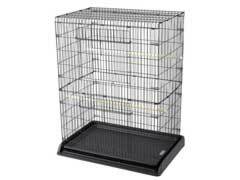 To aid in their outside play time buy a cage that has a perch and food bowls on top. This will give them somewhere to go play and make a mess without getting food and feces all over the floor. Large decorative bird cages are nice, but they rarely include this feature. A tower or other structures on top of cockatoo bird cages are great for hanging toys and treats. This helps keep them entertained, since most cockatoos have a temperament similar to a toddler this can be very important. Another thing to look for is security. Cockatoo bird cages need to be able to outwit the cockatoo they are designed to house. Cockatoos are, again, intelligent birds and they will figure a way out of their cage if it is too simple. Heavy latches or springs on sliding doors are a solid feature, but swing out doors should be avoided because they are easier to escape from if the latch fails. Larger birds have trouble getting out of sliding doors because they can’t crawl out and hold them open at the same time. Breeders with macaw parrots for sale will also inform you of this mischievous trait. Inside cockatoo bird cages need to have a few perches along with lots of toys. Hanging toys are usually a favorite, but toys that can be picked up and manipulated are also enjoyed by parrots. When buying a cockatoo cage it is best to remember that they have the mind of a toddler and many of the same needs. Plenty of room to play, lots of toys, and easy access to food and water are the most important of their needs.